Syfy’s The Expanse is that rare science fiction show that fires on all cylinders: character, story, setting, and message. And its second season, which premieres tonight, is even better than its first. Yesterday, I spoke with members of the cast about the upcoming season—and how it uncannily mirrors a political landscape it couldn’t have seen coming. If you’re unaware of the series, The Expanse is based on the books by James S.A. Corey, and set somewhere between now and the kind of high-tech/magic future of Star Trek. In this future, humans have spread to Earth, Mars, and the asteroid belt, and all three of those groups hate each other. Earth has larger numbers and resources. Mars’ strength is its military technology. The Belt is full of miners who feel very much taken advantage of by the much more elitist Mars and Earth. “In our show, every single faction, Earth, Mars, and the Belt are all masters of manipulation. They all spin their perspective and use fear to basically get their agenda served,” further explained Cas Anvar, who plays the Martian pilot Alex Kamal. That delay between shooting the series and completing the episodes is what makes the issues the show has weaved into its fabric so surprising. They are shockingly prescient. There’s a politician on Earth with the slogan, “Earth first.” There’s a company of Martian Marines with internal tension because one of them immigrated to Mars from Earth, so he’s not considered a “real” Martian—even though, as he explains, his family loves Mars more because they fought and worked so hard to move there. There are people manipulating people’s fear and hatred of each other to further their own agenda. And they show is adapting a book series that began in 2011. So how it does mirror the world of 2017 so perfectly? “It really does tackle a lot of topics, especially in the political environment we’re in right now,” said Anvar. “You’ve got writers who are very intuitive who are very in tune with the way things are. When Ty and Daniel [the two writers behind the pen name James S.A. Corey] wrote this stuff, they were organically in tune with what was going on in the world. When the writers are so in tune with the world around them and they write with such authenticity, they end up relevant, even five, six years later. Believe the hype: The Expanse is the latest and greatest in the grand science fiction tradition. It creates a setting that lets the writers explore human nature in a way that feels less confrontational than if it were set in modern times. The cast is very diverse and female characters—look out for new lead Frankie Adams as Bobbie, a Martian Marine—are fully fleshed out, never serving as props for the male characters. In a sense, it’s an uplifting view of the future—one tempered by the way the show acknowledges that human tribalism is hard to eliminate. “The great benefit of science fiction as a genre is that you’re able to talk about things politically, philosophically, interesting that may not be digestible to an audience if it were present day,” said Strait. “What I love about Naomi and Holden is that it’s such an unconventional romantic relationship to what we’re used to seeing on screen. And it heavily relates to issues going on now,” added Dominique Tipper, who plays Belter engineer Naomi Nagata. “They’re divided by their politics. They clung to each other out of desperation, they’ve fallen in love with each other for reasons they don’t quite understand, but they have very different views of the world and how [things] should be done. And they end up getting into heavy conflict that’s tough to overcome. And I know a lot of people going through that now with their family members or partners or old school friends. They just can’t understand their political standing. 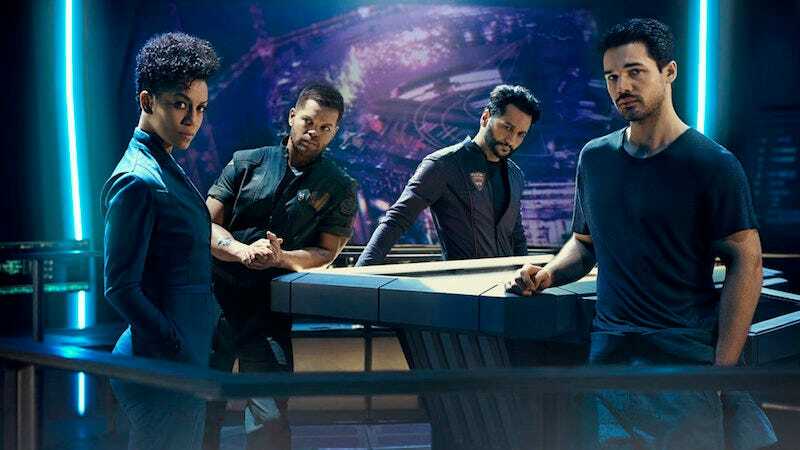 Anvar sees that need for unity, which is expressed in the show with the diverse crew of the Rocinante, being expressed in actions we’ve seen in the last few weeks. “You get people rallying and doing marches in New York, and Toronto, and California, and all across the planet you have people rallying and expressing their dissatisfaction. And they’re doing this without any obligation, they don’t have to do this. And there are people that are so pissed off with things that have been set into motion, with the ban of people coming into the country, you’re getting people who are not from those countries who are furious. Because it does not speak to them, that is not something that speaks to them. “Jim Holden, the character that Steven Strait plays, is an incredible example of an individual who represents all those voices who are willing to put themselves on the line to get information out there,” Anvar concluded. The Expanse season two premieres on Syfy tonight.